Serving clients since 1984, our team at Gerald Giel Garage Doors knows their way around garage doors. Our highly trained experts sell, install and maintain garage doors throughout the greater Pittsburgh area. When customers ask us which garage door they should buy for our cold climate, we always recommend a Garaga door. Garaga offers beautiful, energy efficient doors for residential and commercial use. Available in a wide range of colors and styles, their garage doors are fully customizable. To find the perfect GARAGA garage door for your home, please visit our image gallery. Would you like to see first-hand what we have to offer? Come visit our showroom! We’re located at 700 Pittsburgh Rd., Butler, PA 16002 and at 2044 Monongahela Ave, Swissvale, PA 15218. Our hours are from Monday to Friday, 7:30 am to 3:30 pm. Not able to come to us? Let us come to you! Call us today at 724-586-6590 to set up an appointment or use our online quotation form for a no-obligation quote. Nothing works harder than your garage door opener. It must move the largest door in your home, which can weigh hundreds of pounds. Luckily, today’s openers are built with safety in mind. Infrared beams, sensing technology and reversing mechanisms all help ensure the safe operation of your garage door. LiftMaster garage door openers, manufactured by the Chamberlain Group, are the best on the market. They are safe, reliable and high-performing. LiftMaster is known for its innovative technology, keeping you connected at all times. Their openers allow you to easily use your garage door while always keeping you and your family safe. At Gerald Giel Garage Doors, we carry a wide range of LiftMaster products for all types of garage doors, including those for residential, commercial, industrial and agricultural uses. Please visit our door opener page to learn more. At Gerald Giel Garage Doors, we have two main specialties: the installation of new garage doors as well as the repair and maintenance of existing doors. 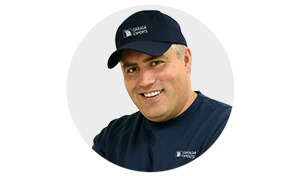 Since we pride ourselves in providing the best possible service to our clients, all of our technicians are qualified Garaga Experts. This certification guarantees the proper installation and repair of your garage door. As part of our preventative maintenance program, our fully-trained technicians will inspect your garage door systemfrom top to bottom. They will complete any necessary maintenance to ensure your garage door and door opener are in perfect working order. Located in Butler, Pennsylvania, we serve the Greater Pittsburgh area, including Cranberry, North Hills, Monroeville, Penn Hills, Ross Township, Shaler Township, Ambridge, Beaver Falls and more. Call or come and see us today! We look forward to serving you. Cranberry, Monroeville, North Hills, Penn Hills, Pittsburgh, Ross Township, Shaler Township, Ambridge, Beaver Falls, Butler, Gibsonia, Grove City, Kittanning, New Castle, Slippery Rock, South Park Township, Wexford, Zelienople.